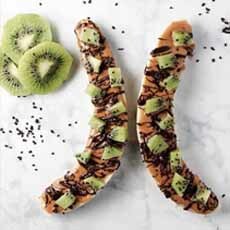 These healthful snacks—bananas, peanut butter and a second fruit—have so much pizzazz that we think they can go right to the dessert plate. You can use any flavor of peanut butter (check out these flavors from PB & Co.—dark or white chocolate, honey, pumpkin spice). Dessert sauce: caramel, chocolate, etc. For a DIY experience, put all the toppings on the table and let everyone create his/her own. 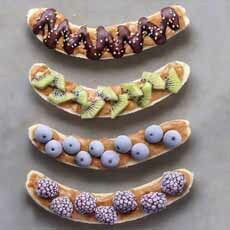 &  Decorate bananas for snacking and dessert (photos courtesy Crazy Richard’s Peanut Butter). For something more filling, adds a side of Greek yogurt or ricotta cheese. We sweeten our ricotta with a bit of Splenda, to emulate cannoli cream. Sour cream is another great pairing. For a fancier dessert, add ice cream/frozen yogurt/sorbet and a dab of whipped cream. HERE’S MORE BANANA FUN & THE HISTORY OF BANANAS.